With BigCommerce for WordPress, merchants may use content marketing to attract customers searching for solutions. The WordPress front-end powered by BigCommerce blends ecommerce and content experience to build customer loyalty. Many brands use the power of content marketing to create and keep a lasting relationship with their customers. You may find excellent examples of content marketing almost in any retail category. Marketers recognize the positive impact of user-generated content such as blogs, photos, and videos. When done right high-quality educational content helps in positioning the brand as a trusted adviser and as a thought leader. When it comes to content marketing WordPress is the number one platform for online content management Currently, WordPress is the most popular and SEO friendly CMS (content management system) that controls about 60% of the market. The idea to integrate WordPress and e-commerce is not new. Can you operate a modern, scalable and secure ecommerce store on WordPress? The answer is yes. There are already WordPress plugins that extend it with eCommerce functionality. The most popular is the WooCommerce plugin. However, running eCommerce and WordPress as one platform has limitations and disadvantages. One of the difficulties is performance. WordPress developers optimized the CMS core for regular content but not for ecommerce. Merchants expect from E-commerce systems to handle large product catalogs, many shopping cart and order transactions. The second reason is security. An eCommerce system needs a more secure back-end than a regular CMS. The requirements for hosting a content-only WordPress site and an ecommerce store are entirely different. An E-commerce site needs more server power and stronger security than a content website. E-commerce SaaS (software as s service) platforms solve both performance and security problems. How can we have the most popular CMS and a secure, highly scalable e-commerce SaaS working together? BigCommerce has some exciting news! Recently they launched their early access developer beta BigCommerce for WordPress plugin. This plugin is amazing news for the millions of merchants using WordPress. 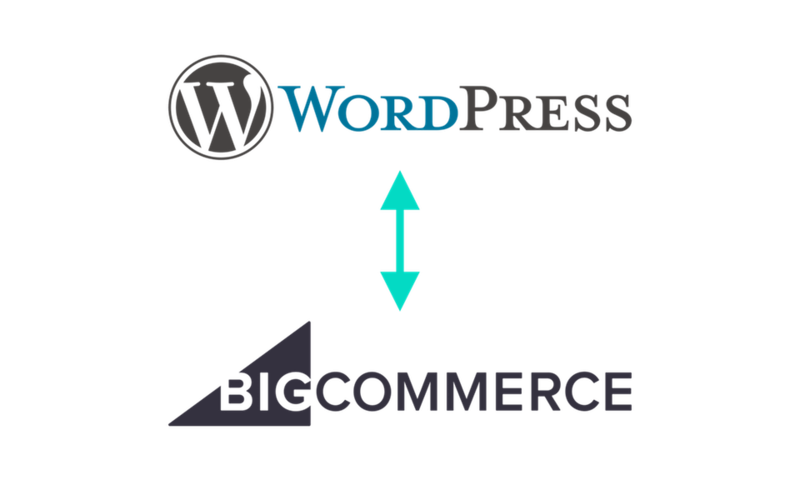 It will combine the flexibility of the WordPress platform with BigCommerce’s powerful commerce engine. This partnership will allow WordPress users to scale their ecommerce stores like never before. Once installed on WordPress, the plugin is powered by the BigCommerce API, passing over the merchant’s entire product catalog. In developer terms, this blending of two platforms is known as headless. WordPress delivers the front-end experience (website) while BigCommerce handles the commerce-specific aspects of the website (catalog management, transactions, order/shipping management, etc). It is the best of both worlds. Give WordPress sites access to the industry-leading ecommerce capabilities necessary to grow an online business. Quickly integrate end-to-end commerce capabilities to an existing site experience using all BigCommerce has to offer for your business needs. Get full catalog data access within WordPress so you can do what you want – No iFrames necessary! Customize your product cards, lists, and cart without risking plugin updates that will undo your work. That’s just a quick glimpse on what this integration has to offer. Click here and learn more on how you can build the best site out there with BigCommerce and WordPress!